By Community Chickens on February 15, 2013 Visit Community's Website. A friend of mine recently asked me why her beautiful white Cochin bantam was turning yellow. She admitted that the spring freezing and thawing has done a muddy number on her coop and run, but that it seemed like the problem was something other than a “dirty” issue. Evidently, she read my post Chicken Bath 101 and attempted to wash the yellow feathers clean, but without luck, her Cochin was still yellow after she was dry. This has happened with many of my white birds in the past. Even our Pekin ducks started out almost blue-white and have warmed to a creamy color, almost like they’ve been dipped in tea. 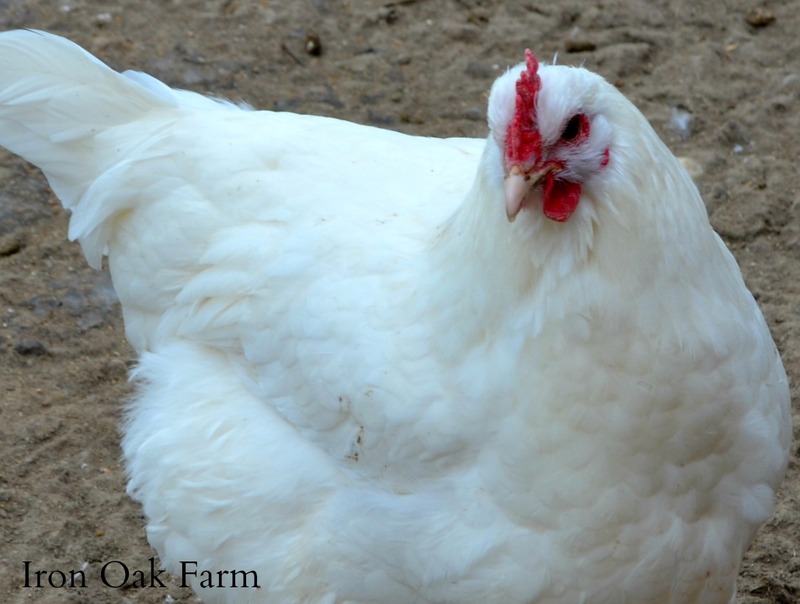 Here are a few reasons why white chickens do this. This is a close up of our Coronation Sussex Rooster’s back. Our chickens and ducks spend a great deal of time in the sun. They free range all over our property, which is basically a sunny field. There are spots of shade under the few pine trees we have, and next to the out-buildings, but for the most part the chickens enjoy roaming the yard in the sunshine. Because of this, most of our white chickens have a strip of yellowish-creamy color down their necks and across their back. 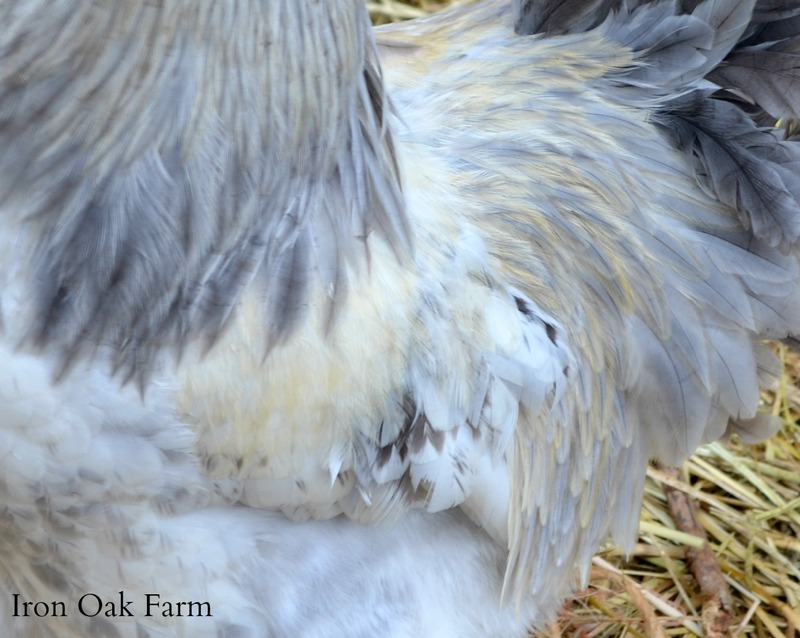 Too much corn in the chicken feed can also cause feathers to yellow. If you do mix crack corn with your feed, and you notice yellowing, you might consider cutting back or eliminating it all together. There are other foods that can also cause yellowing. Dark leafy greens, grass, and marigolds. Some white birds are more prone to brassiness because of their genetic makeup. While I don’t claim to be a chicken geneticist, the way I understand it is there are two basic pigments that cause feather coloration. There is eumelanine, which is responsible for black and brown pigments and pheomelanine which is responsible for yellow and red pigments. When a bird appears white it is because the pheomelanin is absent. But sometimes it’s not completely missing and the yellow color can appear. The Genetics of Chicken Colors. Especially in birds like Cochins with feathers on their feet these “high traffic” areas can be prone to stains and discoloration. Constant sweeping of their feet through mud, grass, and anything a chicken can scratch through can sometimes permanently stain feathers. For the most part, the yellowing of feathers is a harmless phenomenon. I believe that sunshine, leafy greens and free range grass are a healthy part of a chicken’s diet and lifestyle, which also transfers to healthier eggs for us to eat. If you do suspect that corn might be the cause, perhaps reconsider feeding it, as corn has little nutritional value in the first place. But if you just can’t live with the yellowing there are a few things you can do. Unless you show your chickens, it’s probably best to simply let them be and value the fact that the yellow feathers are a sign that your chickens are living the natural life! And in the Fall, their beautiful white feathers will reappear after their next molt. Some mash companies add yellow food coloring to their recipe. I had to switch because everything got yellow. Our Pekins were turning yellow over the summer and after doing some research I realized it was the enormous amount of weeds and grasses they were eating, along with the marigold I was adding to their feed. In addition, our well water has a bit of iron in it, which turns not only the Pekins yellowish/orange but our white bath towels! There is another reason for yellowing of white feathers: we owners who tend to pick up, pet, and generally love on our chickens leave the oils from our hands on their feathers! The feed-based source of yellowing plumage would likely be the fat-soluble beta carotenoid pigments that make the egg yolks of pastured hens so orange. I suspect these would show up in the preen gland and be deposited on the feathers during grooming. 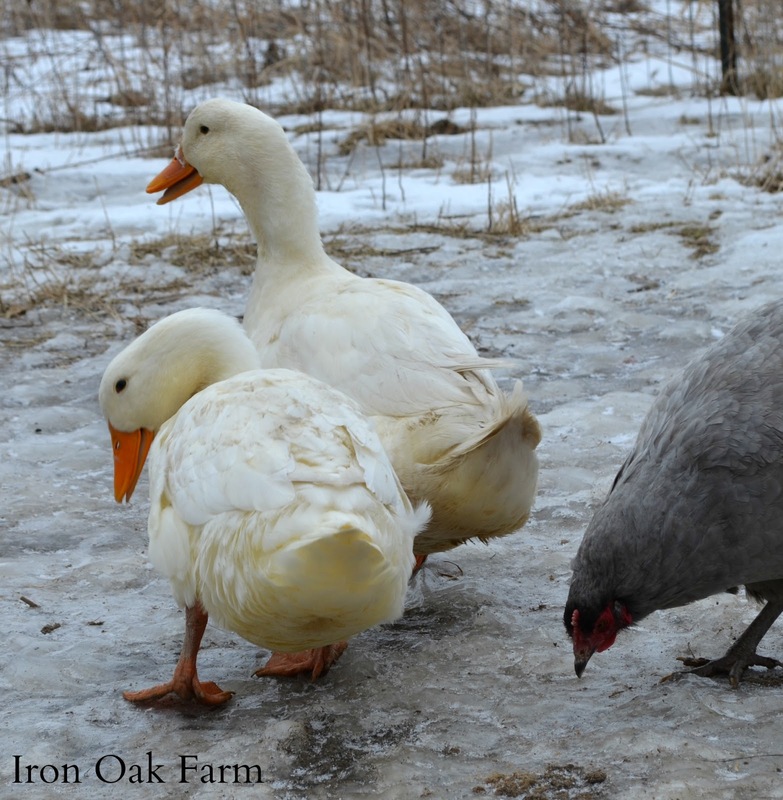 In my flock, snowy plumage would take a back seat to nutrient-rich orange yolks and healthier hens.